Super Eagles Player Ahmed Musa Divorces Wife, Set To Marry His New "Queen"
After being dragged to the Police and reportedly locked up following a much publicized fight with his wife, Super Eagles and Leicester City player, Ahmed Musa, has divorced his wife, Jamila, and mother of two kids. It was also gathered that the player, is set to marry his new Queen, Juliet, who is based in Lagos. reported that the football star had paid off his former wife by giving her one of his houses in Kano as well as a recent model Honda car. It is alleged that both Musa and Jamila lived on the same street in Kano, before they started courting. “Ahmed Musa has divorced his wife. “He gave her Saki Uku (which in Hausa literally means a final divorce). “She is already back home in Kano trying to get her life together again" the source said. 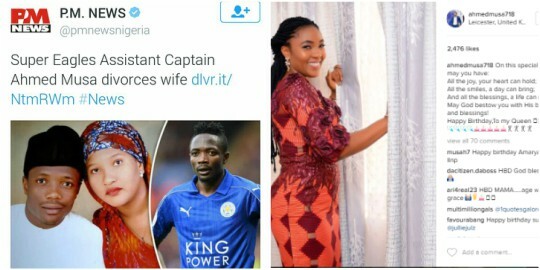 » Super Eagles Player Ahmed Musa Divorces Wife, Set To Marry His New "Queen"